We recently got given this book and it's already one of my favourites. The first time I read it, I had tears in my eyes as it's very sweet and moving. 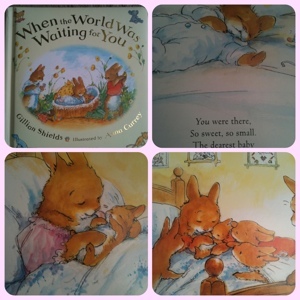 It's all about a family of bunnies who are getting ready for a new arrival. Each page has a small rhyme and it is a lovely book to read to Bubba at bedtime (gentle and calm time). The pictures are very cute and the bunnies are cuddly looking. I would give this as a gift for a newborn and I know that if we are blessed with more babes then a copy will definitely be given to them too. It's just a really lovely read.